Hindavi Public School Satara Recruitment 2019 Assistant Teacher/Clerk/Peon Jobs Application Form,Assistant Teacher/Clerk/Peon Jobs in Hindavi Public School Satara. Language and minimum 3 Years Teaching Experience for Hindavi Public School Satara Assistant Teacher, Clerk, Peon Jobs. 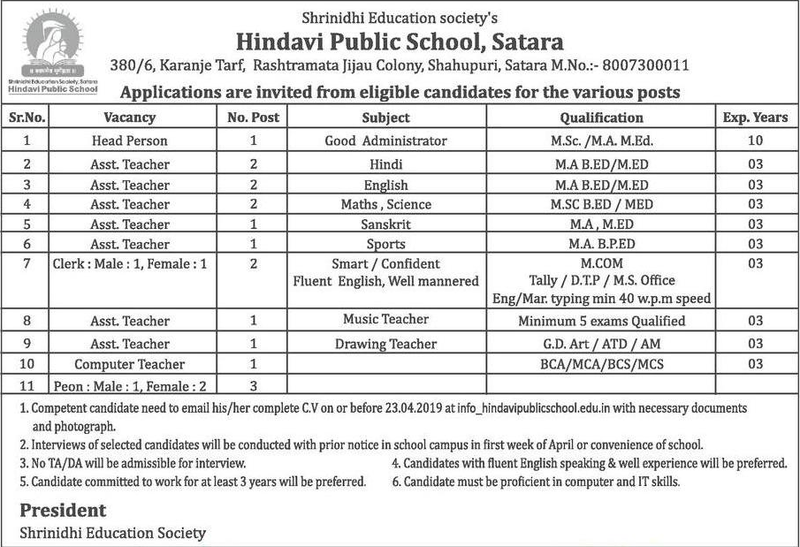 Eligible applicants can apply offline for Hindavi Public School Satara Assistant Teacher, Clerk, Peon, Computer Teacher, Head Person Vacancies. For these jobs you can apply from 19-03-2019 to 23-03-2019. Interested & Eligible applicants can send their Updated resume and all necessary documents with Pass port size Photograph to the given below Email address. 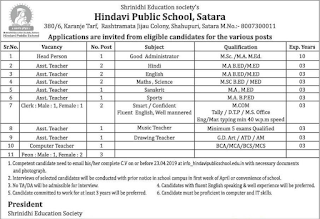 For more details refer the official website www.hindavipublicschool.edu.in for Hindavi Public School Satara Assistant Teacher, Clerk, Peon, Computer Teacher, Head Person Jobs. Required Details like Salary, Important dates, Selection Process, Qualification are given below. Assistant Teacher/Clerk/Peon Jobs in Hindavi Public School Satara. Starting Date to apply for Hindavi Public School Assistant Teacher, Clerk, Peon, jobs: 19-03-2019. Ending Date to apply for Hindavi Public School Satara Assistant Teacher, Clerk, Peon, jobs: 23-03-2019. Interested & Eligible candidates can send their Updated resume and all necessary documents with Pass port size Photograph to the given below Email address.